Asparagus is an excellent source of vitamin K; B vitamins, including folate, thiamine, riboflavin, niacin, and B6; and vitamins A and C. It is a good source of the minerals iron, potassium, manganese, copper, and phosphorus. Asparagus provides plenty of fiber and, for a vegetable, a substantial amount of protein. Asparagus contains asparagine, a non-essential amino acid that contributes to its protein content. It also contains asparagusic acid, which is unique to asparagus. One effect of asparagusic acid is that it causes an unusual smell in the urine of people who have eaten the vegetable. It is known in some folk medicine traditions for its diuretic properties, when this effect may be even more apparent! It has also been used for rheumatism and arthritis, and its effectiveness there suggests anti-inflammatory properties. Six spears of cooked asparagus provide 22 calories, 3.8 g carbohydrate, 2.3 g protein, 0.3 g fat, 1.4 g dietary fiber, 485 IU vitamin A, 10 mg vitamin C, 1 mg niacin, 131 mcg folic acid, 144 mg potassium, 10 mg sodium, 49 mg phosphorus, 18 mg calcium, and 9 mg magnesium. Both the roots and the leaves of the beet are used for food. The roots, with their beautiful, rich red color, are a source of anthocyanins, which can be strong antioxidants. A 2008 study found that drinking beet juice lowered blood pressure, and researchers theorized that this was because of the nitrates in beets. This finding seems somewhat ironic, because nitrites and nitrates have long been suspected of creating carcinogenic nitrosamines in the stomach�s acid environment. But nitrates and nitrites are also involved in a cycle that produces nitrous oxide, which relaxes blood vessels and lowers blood pressure. More research must be done to tease out the particulars. Beet juice appears to help protect the integrity of cells lining the stomach and digestive tract. Thus it may benefit people taking aspirin and other non-steroidal anti-inflammatory drugs (NSAIDs), which are known to damage these cells. For the same reason, it may also help reduce adverse reactions to chemotherapy. Beets provide the minerals phosphorus, sodium, magnesium, calcium, iron, and potassium, along with vitamins A and C, and the B vitamins folic acid, niacin, and biotin. They are rich in fiber, and although a half-cup serving of cooked beets contains more carbohydrate than most of the vegetables in this chapter, their unique Benefits make them a powerful SuperFood. Beet greens are in some ways even more nutritious than the root. A half cup of cooked beet greens has fewer carbohydrates, more protein, more fiber, more of vitamins A and C, and more potassium, calcium, iron, magnesium, and manganese than the beet root, and only about half its calories. What beet greens lack is the red pigment that may be the beet root�s magic ingredient. (cooked beets) One-half cup of cooked fresh beets provides 37 calories, 8.5 g carbohydrate, 1.4 g protein, 0.2 g fat, 1.7 g dietary fiber, 30 IU vitamin A, 3 mg vitamin C, 68 mcg folic acid, 259 mg potassium, 65 mg sodium, 32 mg phosphorus, 14 mg calcium, 0.67 mg iron, 20 mg magnesium, and 0.28 mg manganese. (cooked beet greens) One-half cup of cooked beet greens provides 19 calories, 3.9 g carbohydrate, 1.9 g protein, 0.2 g fat, 2.1 g dietary fiber, 5511 IU vitamin A, 17.9 mg vitamin C, 10 mcg folic acid, 654 mg potassium, 174 mg sodium, 30 mg phosphorus, 82 mg calcium, 1.37 mg iron, 49 mg magnesium, and 0.37 mg manganese. Bell peppers originated in Mexico, but they have traveled to all corners of the world and are essential to countless national cuisines. Bell peppers are the mild-mannered members of the capsicum family�not fiery, but sweet, which is what they are often called. In addition to the relatively common colors of red, yellow, green, and orange, bell peppers can be found in many other colors from white to black, with purple, blue, maroon, and brown in between. As with other brightly colored fruits (peppers are technically a fruit, though they are used primarily as a vegetable in cooking), the pigments are a rich source of phytochemicals with antioxidant potential, including chlorogenic acid (which slows the release of glucose in the bloodstream), zeaxanthin (one of the two pigments, along with lutein, that are found in the retina), and coumaric acid (which may help prevent stomach cancer by inhibiting the formation of nitrosamines). Green bell peppers are somewhat less sweet in taste and may have fewer phytochemical pigments than the other colors. 106 A good source of vitamins A and C, beta-carotene, and the B vitamins thiamine, B6, and folic acid, peppers lower homocysteine levels in the blood (which reduces a known risk factor for heart attack) and provide support for eyes against retinal degeneration. 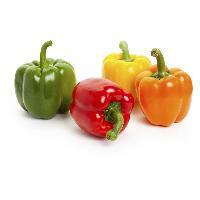 Peppers are low in calories, high in fiber, and 93 percent water by weight. They are one of the best vegetables for sustained release of hydration into the system� a kind of time-release water. One-half cup of chopped raw bell peppers provides 14 calories, 3.2 g carbohydrate, 0.4 g protein, 0.1 g fat, 0.9 g dietary fiber, 316 IU vitamin A, 45 mg vitamin C, 11 mcg folic acid, 89 mg potassium, 10 mg phosphorus, 5 mg calcium, and 5 mg magnesium. 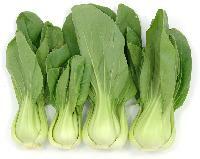 Bok choy, also called Chinese cabbage, is one of the cruciferous vegetables. This family of vegetables, which includes broccoli, cabbage, turnips, and kohlrabi, provides some important cancer-fighting nutrients that are being studied for their potential to not only help prevent some forms of cancer, but also possibly reverse and treat them. Bok choy is a good source of vitamins A, B6, and C, beta-carotene, the minerals calcium and potassium, and dietary fiber. The rich amount of beta-carotene (2,167 mcg in a half-cup of cooked bok choy) may even help reduce the risk of cataracts. One cup of shredded raw bok choy provides 9 calories, 1.5 g carbohydrate, 1.1 g protein, 0.14 g fat, 0.7 g dietary fiber, 3128 IU vitamin A, 31.5 mg vitamin C, 0.35 mg niacin, 0.06 mg pantothenic acid, 0.14 mg vitamin B6, 46 mcg folic acid, 25.1 mcg vitamin K, 74 mg calcium, 0.56 mg iron, 13 mg magnesium, 26 mg phosphorus, 176 mg potassium, 46 mg sodium, and 0.13 mg zinc. Broccoli is an excellent source of the vitamins A, C, K, and folic acid; beta-carotene; and fiber. It�s a good source of the minerals calcium, potassium, phosphorus, and magnesium, as well as vitamins B6 and E, and it provides some selenium as well. Broccoli also provides a substantial amount of lutein, which can help preserve vision and has Benefits for circulatory health. The tight-packed florets of broccoli are extra-rich in nutrition. Although the cancer-fighting chemicals in broccoli are diminished by cooking (especially boiling), cooking increases the bioavailability of vitamin C and iron in this vegetable. Be sure to enjoy it both ways. One cup of chopped raw broccoli provides 24 calories, 4.6 g carbohydrate, 2.6 g protein, 0.4 g fat, 2.6 g dietary fiber, 1356 IU vitamin A, 82 mg vitamin C, 62 mcg folic acid, 286 mg potassium, 58 mg phosphorus, 24 mg sodium, 42 mg calcium, and 22 mg magnesium. Brussels sprouts are the mid-range members of the cruciferous vegetable line and are an excellent source of vitamins A and C, beta-carotene, and fiber. 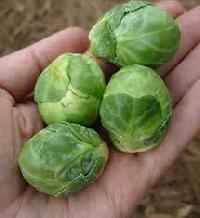 Brussels sprouts have the potential to be especially good for supporting the health of your colon. As well as being high in fiber, Brussels sprouts are an especially rich source of sinigrin, which has been shown to prevent the formation of cancer cells. One-half cup of cooked Brussels sprouts provides 30 calories, 6.8 g carbohydrate, 2 g protein, 0.4 g fat, 2 g dietary fiber, 561 IU vitamin A, 48 mg vitamin C, 47 mcg folic acid, 247 mg potassium, 16 mg sodium, 28 mg calcium, 44 mg phosphorus, 16 mg magnesium, and 0.94 mg iron. Cabbage is the flagship of the cruciferous vegetables. One of the best non-fruit sources of vitamin C, it is also rich in folate and fiber, and it�s remarkably low in calories. As early as 1949, researchers were studying the effect of cabbage juice on gastric ulcers. It appeared that the juice helped the ulcers to heal faster. Since we now know that most ulcers are caused by a bacterium, further study is needed to see why the cabbage juice appeared to be so effective, and whether cabbage juice alone possesses the healing property. (It�s possible that a quart a day of almost any highantioxidant vegetable juice might promote healing just as much!) Cabbage has long been recognized for its anti-inflammatory properties and its positive effect on overall health. One cup of shredded raw red cabbage provides 18 calories, 4.2 grams carbohydrate, 1 g protein, 0.2 g fat, 1.4 g dietary fiber, 28 IU vitamin A, 40 mg vitamin C, 14 mcg folic acid, 144 mg potassium, 8 mg sodium, 30 mg phosphorus, 36 mg calcium, and 10 mg magnesium. Carrots are where carotene gets its name, and with good reason: One medium carrot contains 5,054 mcg of beta-carotene, 2,121 mcg of alpha-carotene, and a whopping 10,191 IU of vitamin A. One cup of carrots provides roughly 686 percent of the recommended dietary allowance (RDA) for vitamin A. A diet high in carotenes has been associated with significant decreases in the incidence of some cancers, including cancers of the bladder, cervix, prostate, colon, larynx, esophagus, and post-menopausal breast cancer. Falcarinol is among the other substances in carrots being investigated for its potential cancer-preventive properties. Recent research suggests that getting carotenes from food is far more effective than consuming supplements. It is possible that beta-carotene from food sources can even be dangerous when consumed in excess. For example, it appears to increase the incidence of lung cancer in smokers. It�s more than a myth that carrots are good for your eyes. A carrot contains 1 mcg of lycopene and 156 mcg of lutein, both of which help protect and preserve the eye. A vitamin A deficiency can result in night blindness, though the connection between high carrot consumption and improved night vision is somewhat less solid. One medium raw carrot provides 31 calories, 7.3 g carbohydrate, 0.7 g protein, 0.1 g fat, 2.2 g dietary fiber, 20253 IU vitamin A, 7 mg vitamin C, 10 mcg folic acid, 233 mg potassium, 25 mg sodium, 32 mg phosphorus, 19 mg calcium, and 11 mg magnesium. Cauliflower is one of the cruciferous vegetables, which have been shown to help reduce the risk of many types of cancers, including lung, colon, breast, ovarian, and bladder cancers. Cauliflower is very high in vitamin C, and it�s a moderately good source of the B vitamins folate, B6, and pantothenic acid. 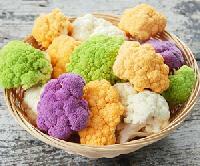 As with most other cruciferous vegetables, it is also a good source of fiber. The familiar white cauliflower is unusual among the common crucifers in being relatively low in vitamin A and carotenes, so for someone who is concerned about getting too much vitamin A, cauliflower is a way to get the advantages of some of the Brassica diindolylmethane and sulforaphane while limiting vitamin A intake. The purple varieties are rich in anthocyanins, which give them their color. Green cauliflowers are slightly richer in nutrients than the white ones, with higher amounts of vitamin A and beta-carotene. One cup of raw cauliflower pieces provides 26 calories, 5.2 g carbohydrate, 3 g protein, 0.2 g fat, 2.6 g dietary fiber, 20 IU vitamin A, 46 mg vitamin C, 58 mcg folic acid, 304 mg potassium, 30 mg sodium, 44 mg phosphorus, 22 mg calcium, and 16 mg magnesium. Celery is mostly fiber and water�by weight, celery is 1.6 percent dietary fiber and 95 percent water. It is an excellent source of vitamin C. Celery also provides the minerals potassium, calcium, molybdenum, manganese, magnesium, phosphorus, and iron, as well as the B vitamins thiamine, niacin, folate, and B6. Celery also provides some trace nutrients, including the male hormone androstenone and apiol, a substance that appears to affect the female hormonal system and was at one time used to induce miscarriage of unwanted pregnancies. The phthalides in celery help it to enhance flavor and richness in other foods, even when its own taste is overpowered. These compounds may also help arteries to dilate, reducing blood pressure. Celery contains coumarins, the best known of which is the anti-coagulant warfarin. Others, such as auraptene, have been shown in animal studies to help prevent cancers of the skin, tongue, esophagus, liver, and colon. Ensaculin is being investigated for its potential in treating dementia. It has not yet been proven effective for this purpose in humans, but its main side effect�low blood pressure�could be a health advantage in the long run. These compounds may also help reduce the risk of blood clots and stroke. In the laboratory, other compounds appear to reduce the growth and proliferation of cancer cells. The one drawback in celery�s nutritional package is that because so much of this vegetable is water and fiber, there�s just not a lot of room for these other nutrients� so you may have to eat a lot of celery to see its benefits. Celery seed has an even longer medical history. It was at one time used as an analgesic, though modern testing has found no such effect. A word of warning: For a small number of people, celery can cause a severe allergic reaction�including anaphylactic shock. There appears to be more of the allergen in celery root than in the stalks that are more commonly eaten in this country, with seeds containing the most. Cooking does not appear to destroy the allergen. One raw stalk (7.5 inches long) of celery provides 6 calories, 1.5 g carbohydrate, 0.3 g protein, 0.1 g fat, 0.7 g dietary fiber, 54 IU vitamin A, 3 mg vitamin C, 11 mcg folic acid, 115 mg potassium, 35 mg sodium, 10 mg phosphorus, 16 mg calcium, and 4 mg magnesium.